Six hard-working West Virginians were honored Oct. 13 for exemplary vocational rehabilitation through the West Virginia Division of Rehabilitation Services. The annual Ability Works Awards honor one outstanding candidate from each of the agency’s six districts, coinciding with National Disability Employment Awareness Month. Somewhere there may be a barrier that James Mason Cowie III cannot overcome, but he hasn’t found it yet. “You can do anything,” Cowie says with confidence, and it isn’t just talk. With that attitude and a lot of determination, he returned to work after a devastating fall that damaged his spine, leaving him unable to walk. Cowie is a mechanic and metal fabricator for ALCO Manufacturing, a small mechanical engineering and fabrication firm in St. Albans. The 42-year-old Charleston mechanic is the statewide winner of the 2010 Ability Works Award and represents the Charleston District. He was one of six vocational rehabilitation clients honored at the Ability Works Ceremony by the West Virginia Division of Rehabilitation Services October 13. DRS annually recognizes one exemplary client in each of its six statewide districts in celebration of National Disability Employment Awareness Month. The awards ceremony was at the West Virginia Culture Center at the State Capitol Complex in Charleston. The extent of Cowie’s injuries after his work-related fall was significant, and it’s likely he would qualify for Social Security Disability Income assistance. That prospect did not appeal to him. Cowie’s work experience before his injury was in the restaurant business and in construction. He soon understood his options there were limited by his injury. Charles Allen, who owns ALCO Manufacturing and works alongside Cowie, appreciates that attitude and Cowie’s never-say-quit work ethic. Debbie Riggie, a senior rehabilitation counselor with the Division of Rehabilitation Services, nominated Cowie for the Ability Works award. Michael Carothers, who has a congenital heart condition, began his journey as a young man asking questions about vocational options and resources. Now at the age of 23, he is a career counselor who helps other young people find their own answers. In his role with Venango Training and Development Center, Carothers works with Pennsylvania high school students who have disabling conditions or socioeconomic disadvantages. He helps these young people explore future employment opportunities and goals as well as available resources. 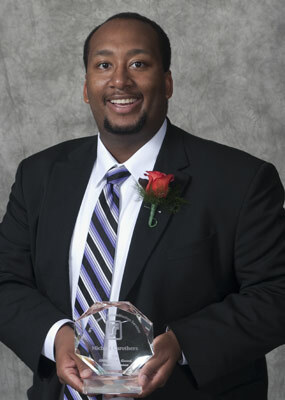 Now a resident of Franklin, Pennsylvania, the young career counselor, formerly from Bridgeport, was the Clarksburg District winner of the 2010 Ability Works Award. He was one of six vocational rehabilitation clients honored at the Ability Works Ceremony by the West Virginia Division of Rehabilitation Services October 13. DRS annually recognizes one exemplary client in each of its six statewide districts in celebration of National Disability Employment Awareness Month. The 2010 awards ceremony was at the West Virginia Culture Center at the State Capitol Complex in Charleston. 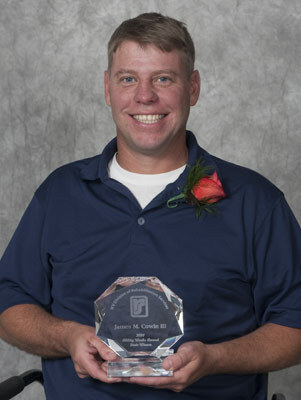 Carothers, formerly of Bridgeport and now of Franklin, Pennsylvania, is the Clarksburg District winner of the 2010 Ability Works Award from the West Virginia Division of Rehabilitation Services. While a senior at Bridgeport High School in Harrison County, he first met with DRS Rehabilitation Counselor Kathryn Beverly. Carothers was eager to learn about future employment options, training and resources. Together he and Beverly assessed his interests, talents and abilities. Then Carothers decided to pursue a bachelor’s degree and to become a secondary education teacher. His choices focused on his communication and academic strengths while bypassing the potential barrier of physical exertion limits. When considering Carothers’ sense of caring and spirituality in combination with his giving extracurricular activities, Beverly said, they both knew that he belonged in a helping profession. Carothers earned a Bachelor of Science degree in sociology from West Virginia Wesleyan College in Buckhannon. DRS provided financial assistance for that, and links to other assistance. After graduation, Carothers learned to create a resumé with advice from his rehabilitation counselor. Now he is a well-respected professional working with high school students to help them set and achieve their adult employment goals. “He has a gift in working with young people, in helping them guide their lives to be productive people and to choose careers that are good matches for them,” Beverly said. As a successful former client, and as a career counselor, Carothers recommends that people considering DRS services take that first step to set up an appointment and meet a vocational rehabilitation counselor to learn about the variety of services available to help them attain their employment goals. When a good idea just doesn’t work out, sometimes something better comes along. That’s what happened for Katrina Blankenship, a mother of three who sought vocational guidance and job placement assistance to work from her home. She works now for the Doddridge County Commission as an office assistant at the county’s day report center, an alternative sentencing program for low-risk substance abusers and non-violent offenders. The rest of the story is everything that happened in between. The 36-year-old assistant from West Union was the Wheeling District winner of the 2010 Ability Works Award. She was one of six vocational rehabilitation clients honored at the Ability Works Ceremony by the West Virginia Division of Rehabilitation Services October 13. Blankenship has cerebral palsy. Apart from some help with assistive technology on the computers she uses at work and at home, the help she sought from DRS was primarily in the form of vocational counseling and guidance. Tamela S. Cross, a rehabilitation counselor in the Sistersville branch office of DRS, was the first to meet with Blankenship. DRS Employment Specialist John Stiltner, meanwhile, was helping various local employers find workers for some job openings. He thought Blankenship might be a good fit for one of those jobs. Her salary was funded initially by a federal grant which expired, but her work had so impressed Sheriff Worthy Underwood that he recommended Blankenship for this job with the Doddridge County Commission. “She is always at work on time. She always completes any task that I’ve ask her to do,” said Tammy Satterfield, Blankenship’s supervisor. Cross, the DRS counselor, sees a bright future for Blankenship and her family. Shannon Dunbar darts around the WorkForce West Virginia offices in the Fairlea area, cheerfully assisting job applicants as they prepare their résumés, answering phone inquiries, planning two job fairs a year – all with no outward indication that in 2005, a motor vehicle accident nearly killed her, causing a traumatic brain injury that threatened to rob Dunbar of her ability to work. Moreover, her supervisor says she is very pleased with Dunbar’s performance as the WorkForce information specialist. Among the qualities that appeal most to Dunbar’s boss, “dependable” and “motivated” top the list. 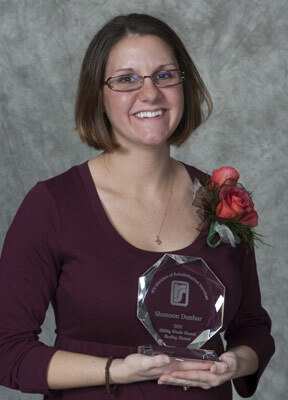 Shannon Dunbar, 23, of Gap Mills, Monroe County, was the Beckley District winner of the 2010 Ability Works Award. 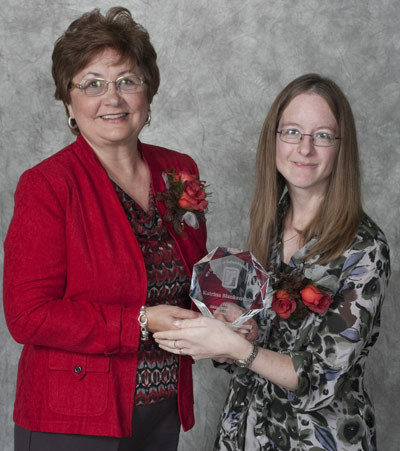 She was one of six vocational rehabilitation clients to be honored at the Ability Works Ceremony by the West Virginia Division of Rehabilitation Services October 13. Dunbar benefitted from a team approach at DRS that involved Senior Vocational Rehabilitation Counselor Nancy Harris, Employment Specialist Patricia Moody and Senior Rehabilitation Counselor Jeff Myers, who first worked on Dunbar’s case. They provided her with guidance counseling, testing, résumé assistance and job search help. She supplied the persistence, good attitude and hard work. Furthermore, she successfully learned how to manage residual symptoms from the accident and to develop compensating strategies. Harris notes that Dunbar is a perfect match for the job, because of her strengths, which include a proclivity for neatness, people skills, organizational skills and internal motivation for work excellence. “With regard to Shannon’s future, I think the next chapter is going to be just as challenging and rewarding as the last,” Harris said. Dedicated and determined, Krystal Baumann spends her workday teaching ninth grade algebra classes, providing students help and encouragement, and sharing optimism and laughter with everyone at Huntington High School. She also coaches the girls volleyball team, which is a second school role she took on with enthusiasm to help the school and students. "I think what makes Krystal a good employee here at Huntington High is that she is willing to do whatever it takes to be successful," said Greg Webb, Huntington High School principal. "And this is not only success for herself, but success for her students in her classroom." 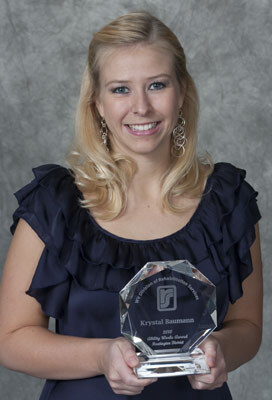 Baumann, 23, was the Huntington District winner of the 2010 Ability Works Award. She was one of six vocational rehabilitation clients honored at the Ability Works Ceremony by the West Virginia Division of Rehabilitation Services at October 13. "I think I nominated her mostly because of her attitude," DRS Rehabilitation Counselor Jill Kelley said. "She never missed a beat after her accident during her college years. She still finished her four-year degree in four years. She was still a college cheerleader . . . it was impressive." In 2006 as a freshman student and cheerleader at Alice Lloyd College in Kentucky, Baumann lost her left foot and lower left leg as a result of a car wreck. Her father who is an assistant high school principal knew about the DRS mission and services, so he helped his daughter apply. Baumann persevered through the challenges of recovery while refusing to give up on her goal of becoming a math teacher. Upon returning to college, she took heavy course loads to ensure she would graduate on time in May 2009. Baumann credits the love and support of family and friends inspiring her to continue working toward her career goal after the accident. Her parents helped her with every step of her recovery and her education, she said. A positive attitude and strong work ethic brought Baumann to a successful completion of her educational goal. DRS helped along the way with some vocational counseling and assistance with books and supplies. After graduation, she started applying for jobs as a high school math teacher in her native Cabell County, and, in August 2009 the Cabell County Board of Education hired her to teach algebra at Huntington High. "I think Krystal performs especially well in her interaction with the kids," Principal Greg Webb said. "She is in a freshman, ninth grade academy. On the high school level, that just seems to be the problem area. . . . Kids need that adjustment time in the ninth grade. With her age and her ability to work well with those kids, that movement from middle school to high school has been eased." "I love the kids," Baumann said. "Love them! I enjoy every day coming in hearing them talk and carry on. They’re all usually really silly in the morning and it helps me get the day off to a good start. They always seem to come to me and want help ... and want to talk about everything. It just helps me get through my day, hearing about their lives."